I've gotten some questions on where can folks find Gears Jerseys. The answer is; you can't. And even if you do find one up for auction they can go for a lot of cash. I saw one sold to a collector in Japan for $3,700. So, there follows where can you get a replica? Well, I just bought one and here is how you can get one. 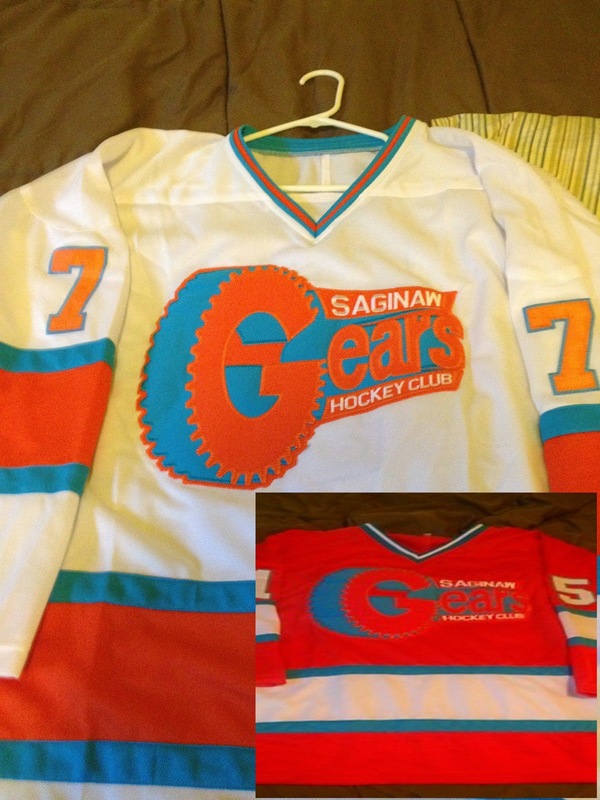 Go on e-bay and search "Saginaw Gears Jersey" and the photo seen here will come up. The cost is about $80, they are custom-made after you order and so it takes a couple of MONTHS before you get your jersey. Mine took several months because the fellow who sells these wanted it to be exactly right. Still, I got my #15 home jersey and it is just SUPER. I love it! The logo and numbering are done in layered thick material just like the original 1972 version of the Gears sweater and the colors are dead-on correct. Now- full disclosure: Neither I, nor Saginaw Gears Dot Com makes a single cent from the sales of these jerseys. The purpose of this post it simply to inform you Gears fans that I got one of these, I love mine, it is high-quality and e-bay is the place where you can get yours. REMEMBER- I get $0 for the sales of these jerseys, in fact I paid full price for mine.